"Thank you for a fantastic day in the wonderful Victoria Baths. It is an amazing place and we cannot wait to come back again to shoot some more models in the new year"
Victoria Baths provides a unique, unforgettable setting for a wide range of events. Wedding receptions, photoshoots, staff training events, food and drink festivals, and a great variety of arts performances and exhibitions have worked exceptionally well here. 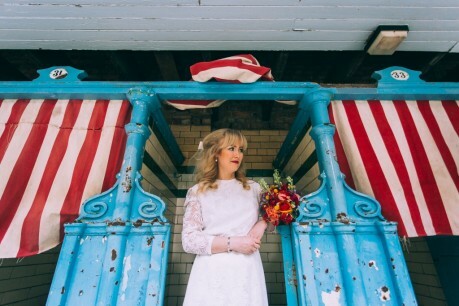 Victoria Baths is licenced to serve alcohol and host wedding ceremonies. There are many different spaces and backdrops, from the grandeur of the Gala Pool and 1st Class entrance to the more modest Females Pool and Superintendent's Flat. Check out the Spaces page for images, downloadable plans and information on room capacities. PLEASE NOTE that Victoria Baths is unheated, so we are a seasonal venue. Filming and photoshoots can take place all year round but events involving invited guests generally only take place from March/April to October/November. Our Terms & Conditions of Hire are downloadable below along with a Booking Form. Our Events Team are happy to show you around and discuss any proposed booking. We look forward to your call or email. Many thanks to Tom Biddle for his image above taken on a Shoot Joy photography workshop run by Cassandra Lane at Victoria Baths in 2017.